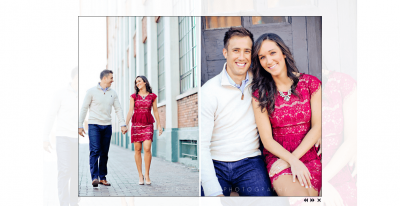 Jessica Strickland Photography has been our client for over a decade. The company recently went through a re-branding and needed an updated website to match the new brand. Her new logo is very bold and colorful, so that was the inspiration behind the new design: bright, bold colors and modern text. One big change was making a few of the main sections all available on the main page to make the site easy to navigate. One issue with the last site was that finding sessions had to be done through browsing, which made it difficult to find sessions sometimes. With the new site, clients who were photographed by her recently can visit the site and see their session on the home page. The main section features a session or event of her choosing, and below are thumbnails of recent events for easy browsing. The sidebar includes a link to learn about the photographer, a “featured in” section to show which magazines, websites, and other publications she has been featured in, as well as a “Raves” section where clients can submit reviews. Another new change is adding social media feeds for Facebook and Pinterest at the bottom of the page in the “What’s Trending” section. This site also incorporates a responsive gallery. This means that for each set of images, whether it be in an events gallery or a session archive, there is a set horizontal and vertical with so that the images will tile and fit together when the page is expanded or collapsed. This allows for a quick overview of all of the session images. The images can be clicked as well to enlarge, and there is the option to share the link on Facebook or pin a specific image on Pinterest to keep her followers up to date on recent work. The testimonials and reviews are responsive tiles as well. The new site also features the ability for her to broadcast her latest blog posts to Twitter and Facebook to reduce her workload when creating blog posts. 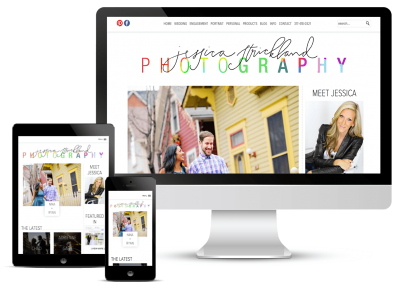 The new site also offers her a much more streamlined process for adding photos to a blog post, reducing her average time to produce a blog post by several hours.